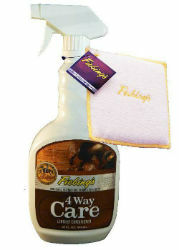 Fiebing's most complete all-in-one cleaner and conditioner for use on smooth leather. NOW with a free microfiber sponge! 4-Way Care preserves by waterproofing and replenishing tanning oils. Strengthens by coating each leather fiber with a blend of the finest leather oils and waxes. Beautifies the finish by coating it with waxes which also aid in resisting dirt and cleans fine leathers.